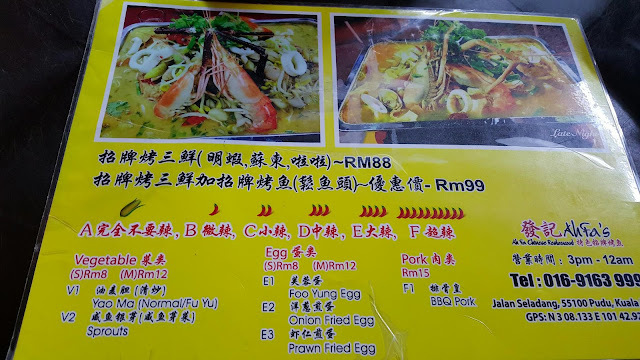 Recently there's a famous Seafood Hotpot stall - Ah Fa Chinese Restaurant, opening beside the roadside of Jalan Seladang, Pudu. We drove to Ah Fa Chinese Restaurant last 2 weeks for dinner with friends. A long queue waiting to be seated and order food. After an hour queue, finally a group of table left and someone walked over to the table. WAIT again...... Customer wait to be seated and take order gotta be improving. The environment there was dark and smelly drain (if you sitting opposite the stall), you have to use your smartphone torchlight while eating. We waited for 2 hours and the people who arrived later than us were started to eat... But we were still WAITING... We asked the lady boss so many times whether our food is ready and she said it's preparing... Ended up with she wrote our order to another table number.... =.= She apologized and took our order and it arrived in 15 mins. 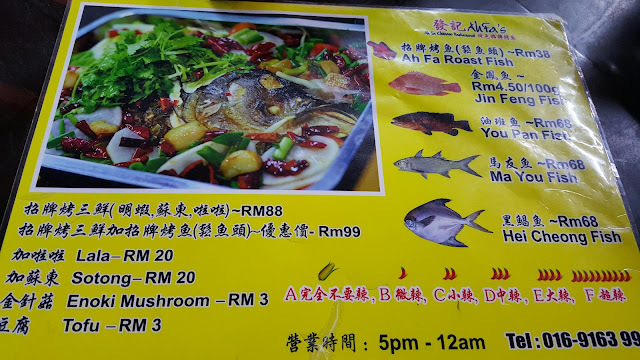 Choose from Roast Fish Hotpot (RM 38) / Seafood Hotpot - Prawns, Squid & Clams (RM 88)/ Roasted Fish Head plus Seafood Hotpot (RM 99). Opt for your preference level of spiciness. 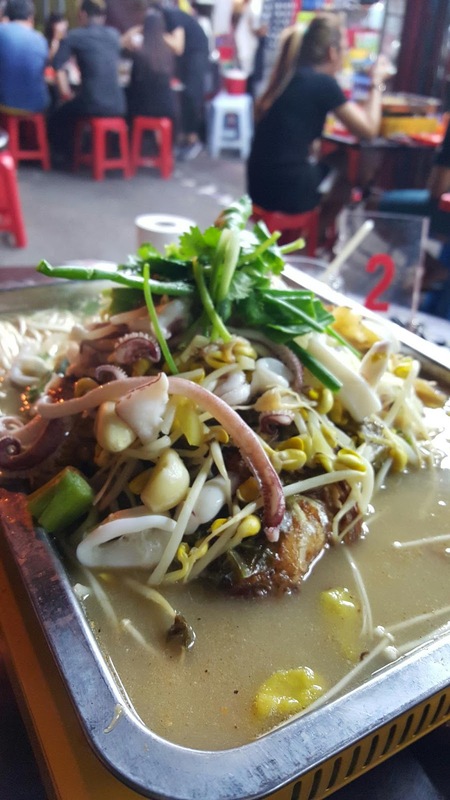 They serving other side dishes such as vege, egg and BBQ Pork. DALANG!!! 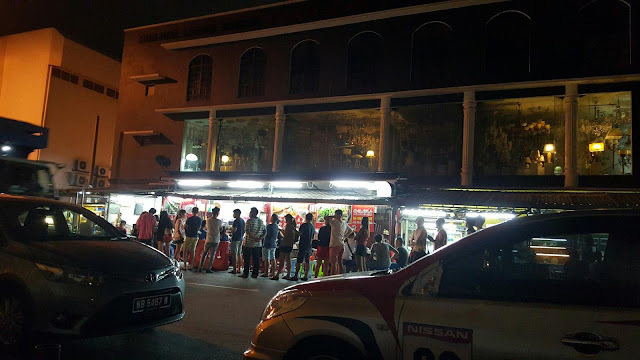 Our 3 hour 15 mins waiting time dinner. 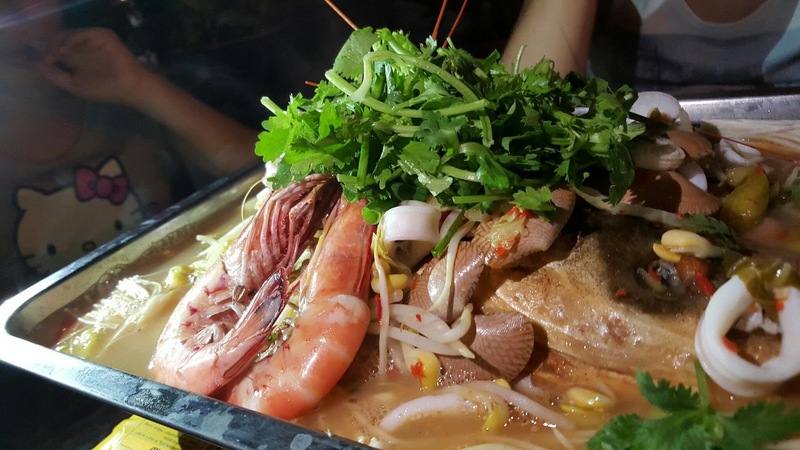 Signature 3 fresh with Grilled Song Yu Fish Head Hotpot ( RM 99). We were excited when looking at the generous portion ( We were super hungry =.=). A portable stove placed on our table and followed by a tray. 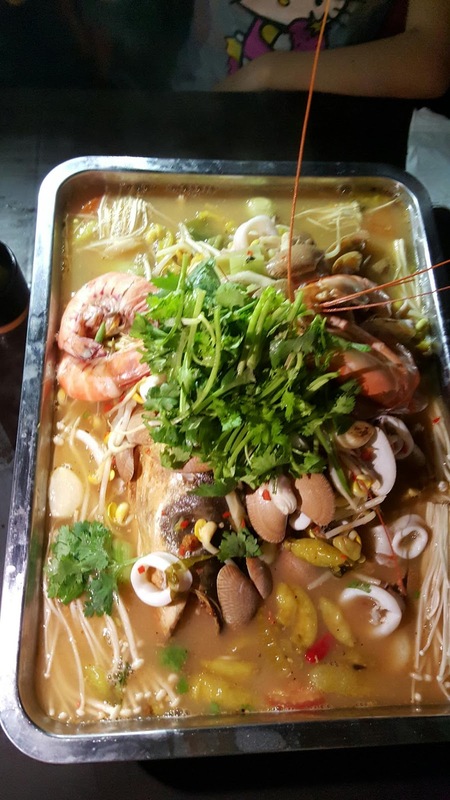 There were 4 pcs big head prawn, squid, clams and a Song Yu Fish head. The broth was consisted of Hunan preserved chilli, dried chilli, tomatoes, picked vege, garlic, leeks and radish with additional order RM6 Enoki Mushroom. When my first sipped, the broth was so spicy and chocked. But after a few more sip, it started out spicy with sour, pretty delicious and addictive. According to lady boss, she's from Hunan and her husband (CHEF) is Malaysian Chinese. Can clearly be seen on this influence of broth. 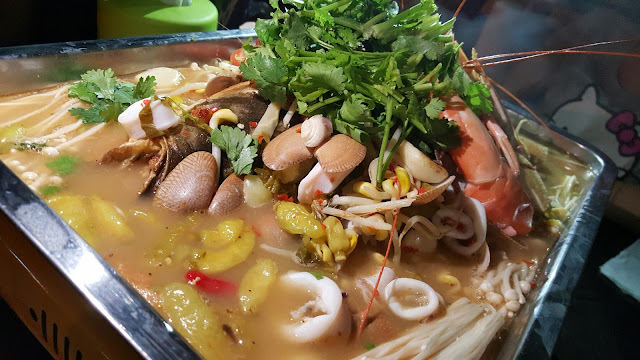 Conclusion, it's quite value for money and delicious broth with fresh seafood. However, first come first serve basis and customer to be seat have to improve. Our second visit last weekend (30/1/2016)! No queue needed and we choose for a bright seat which was outside the stall. 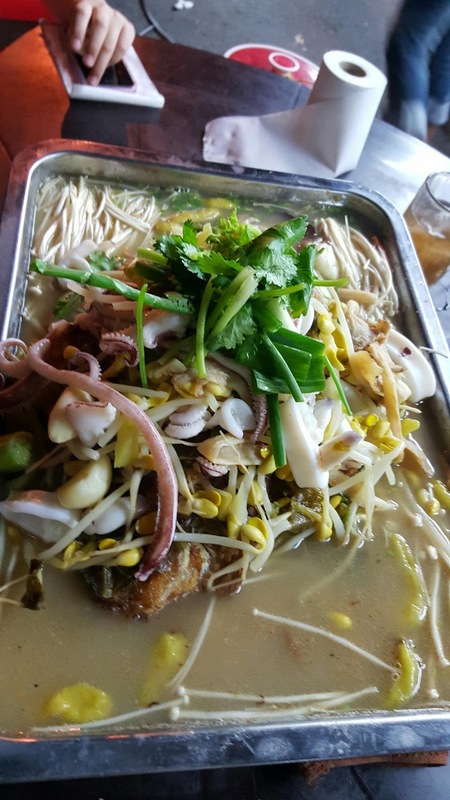 We ordered Roasted Jing Feng Fish Hotpot this time with adding on Enoki Mushroom. Spiciness level we choose B. Fish was fresh and the broth was awesome. Recommend Roast Fish Hotpot if 2 people sharing or not a seafood fans. 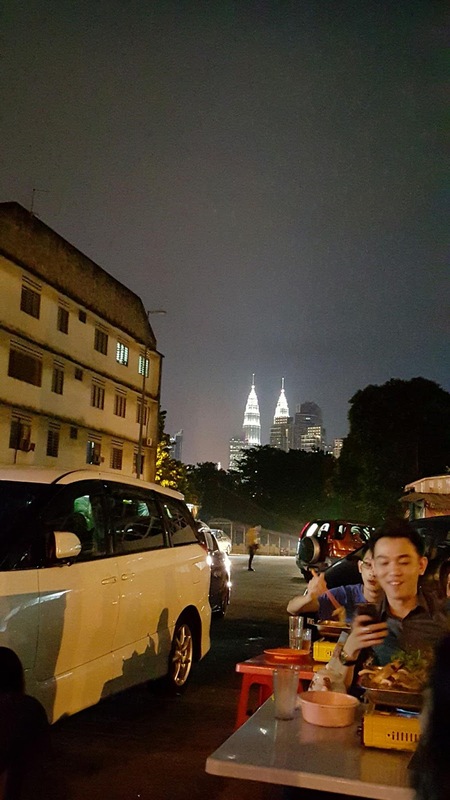 Jalan Seladang, 55100, Kuala Lumpur.